Many of the world’s most popular VPN services are based in either the USA or United Kingdom. These countries have some of the best tech infrastructure and a huge percentage of their populations have high-speed internet access. So the location of these top VPNs make sense. But it’s no secret that companies in the USA and UK are subject to (or even active partners in) government spying. Here in America, many users are used to (or willfully ignorant of) daily privacy intrusions. Google & Facebook have built billion dollar empires on data mining and tracking. So if our every move is tracked by our smartphones/computers anyway, most people could care less if their VPN provider is part of the ‘Big Brother’ data collection. But for some people, ignorance is not bliss. Some people want as much privacy as they can manage to cling to in an increasingly connected world. If this describes you, then you may choose to avoid ‘Popular’ providers, and instead go with a small Offshore VPN. What is an Off-shore VPN? Any VPN service that isn’t located in North America or any country participating in the ‘Five-Eyes’ spy alliance. Though no VPN provider can every be considered truly safe from governmental or multi-national pressure, some countries are certainly more dedicated to privacy than others. It’s reasonable to expect that the NSA could exert more influence over a company based in Germany than one in Hong Kong, Panama, or Vietnam for example. Are there any disadvantages to choosing an Offshore/unknown VPN? Major Companies have a reputation of trust, and track record of integrity: There are thousands of reviews on the web for large VPN companies like PIA, Hidemyass, IPVanish, and NordVPN. They have thousands (or even millions) of customers that could sue them if it turned out they were doing something shady (false advertising, fraud, malware in their software, etc). Small/unknown VPN providers could literally be anyone. They are less known, less tried, and less vetted. Their software could be insecure, unstable, or even dangerous. Previously, some fraudulent VPN services existed that were nothing more than a hacker honeypot to steal passwords/logins, and personal information. Bottom Line: Don’t choose a VPN provider just because they claim to be ‘Offshore’ or ‘Anonymous.’ Try to find a reputable company based in a privacy-friendly country that already has a user base that can vouch for their integrity. It doesn’t pay to be an early adopter when it comes to VPN companies. This is not intended to be a list of all the Non-US VPN providers in the world. We haven’t tried to include every VPN that advertises privacy or safety from NSA spying. We’ve only included providers that we have personal, real-world experience with. We’ve used their software and/or talked to their tech team. In other words, we trust them enough to recommend their services. That said, it’s you can never 100% verify the security/honesty of any private company. Sometimes you just have to go with your gut. Don’t let the name fool you, Proxy.sh is a VPN service first and foremost (though their VPN packages include proxy servers as well). Proxy.sh made a big splash when the first launched, because they’ve raised the bar with the level of transparency and privacy they’ve offered their customers. Transparency Report: They publish a list of all DMCA warrants, and legal requests they receive. 99.9% of the requests are DMCA takedown notices. Open-Source Software: Most VPN client software is closed-source, meaning you never know whether there is malware or an insecure key-generation method designed to enable spying. Proxy.sh’s software is open-source on Github and can be freely inspected for security flaws. Anonymous Account: If you want, you don’t have to share your email address/username with proxy.sh. You can choose receive a ‘Security Token’ instead with no personally identifiable information. Token accounts can only be paid with Bitcoin. Proxy.sh treats privacy and digital freedom like a right, not a privilege. They don’t restrict any VPN uses or protocols on their network (You can download torrents, do skype chats, etc). They also have tons of privacy tools not offered by other providers. In addition to those mentioned above, Proxy.sh also has offers a stealth VPN protocol for getting through vpn-blocking firewalls undetected. They also support end-to-end encrypted chats. 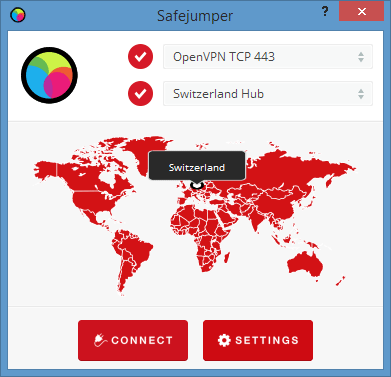 Their SafeJumper VPN client is a no-frills lightweight client. It works well, and has all the security features you’d want, including Kill-switch and DNS leak protection. And best of all, their servers are uncrowded. Server loads under 10% are common. Proxy.sh doesn’t restrict certain uses (like p2p/torrents) to certain server locations. You can download what you want, wherever you want. And if you choose their upgraded ‘Boost’ Plan, you can do it really, really fast! NordVPN is a bit of a rarity. They’re a popular, mainstream VPN service that’s also headquartered in an offshore privacy haven (Panama). So in many ways, you get the best of both worlds with NordVPN. A large user-base that has already tested company’s privacy policies. SmartPlay: This proprietary technology developed by NordVPN will allow you to unblock Netflix-USA, Hulu, and 30+ other streaming services, not matter what server location you’re connected to. NordVPN is one of the last VPNs that still works with Netflix. Special-Use Servers: Dedicated server types for specific VPN uses: Tor-over-VPN, DoubleEncyption, High-speed streaming, Anti-DDOS and more! Our NordVPN review has full details. 30-day Trial Offer: NordVPN has a 30-day, 100% refund policy. That means you can try their service for an entire month risk-free. So why haven’t you signed up yet? You may have already heard of ExpressVPN. That’s because they’re a trusted, premium VPN service. But one thing that most people don’t know? ExpressVPN is based in the British Virgin Islands (privacy haven). Just be warned, ExpressVPN isn’t for people looking for a dirt-cheap VPN. ExpressVPN is a fast, high-quality provider (and they’re priced like it). Plans start around $11/month. That said, if you ‘re looking for a provider with excellent software and responsive tech support, then ExpressVPN is a good pick. Their software is definitely one of the best we’ve tested, and we love the ‘favorite servers’ customization feature they’ve built in. ExpressVPN Privacy: ExpressVPN doesn’t log your VPN activity or usage. They do keep non-invasive connection logs which according to Express, don’t include your IP address (so it shouldn’t be possible to identify a single subscriber based on their VPN-assigned IP). If you’ve heard of FrootVPN before, it’s probably because they made a big splash when they advertised free, unlimited VPN service on the homepage of ThePirateBay. It turned out to be great free advertising, and customers loved those free accounts (while they lasted). Now FrootVPN offers paid VPN services (zero-log & torrent-friendly) and extremely reasonable prices. In fact, you can get a 1-year subscription for less than $3/month! Froot isn’t your traditional ‘Offshore’ VPN (Based in Sweden), but everything about their service shows that they take your privacy seriously. Sweden’s tech startups are actually on the cutting edge of privacy law, and have repeatedly pushed to protect the privacy and security of their users. If you’re looking for low-cost VPN service, Froot or Proxy.sh are excellent choices. Filesharing/Torrent-users: You certainly don’t need to go offshore to download torrents safely (1 Million+ subscribers are quite satisfied with PIA), but some people are extra cautious. If your primary VPN use will be torrenting, we recommend NordVPN or Proxy.sh. Both have a true ‘Zero-Log’ guarantee, and both include Socks5 proxy service (which allows your torrent client to have a unique, anonymous IP address). People who need SERIOUS privacy: If you’re concerned about NSA spying, you probably do need to go off shore. But just know that no VPN company can ever be 100% trusted to protect your privacy. They will always choose the business over a single user it push comes to shove. If you’re mostly concerned about private browsing & email, a combination of Tor, and a Zero-Log VPN service should serve you well.